Sparkly, shimmery and bright is the code of the day when you want to emit that extra radiance at your wedding ceremonies. 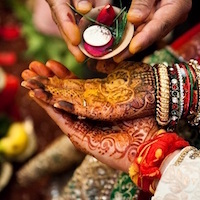 Weddings, right from day one is your day and one should do everything to make themselves feel special whether it be the food, the decoration or the dress. Here are some options for lehengas to kickstart your wedding with a sparkly bridal lehenga on the day of your sangeet. A white lehenga with elegant and pretty embroidery work of gold. It is simple yet stunning. The blouse is delicately decorated with golden embroidery all over, adding just a hint of gaudiness, the lehenga is made in a material meant for flare. Interspersed with a bigger pattern of embroidery and paired with a white dupatta with a heavily embroidered border that sits just rights when taken on one side. 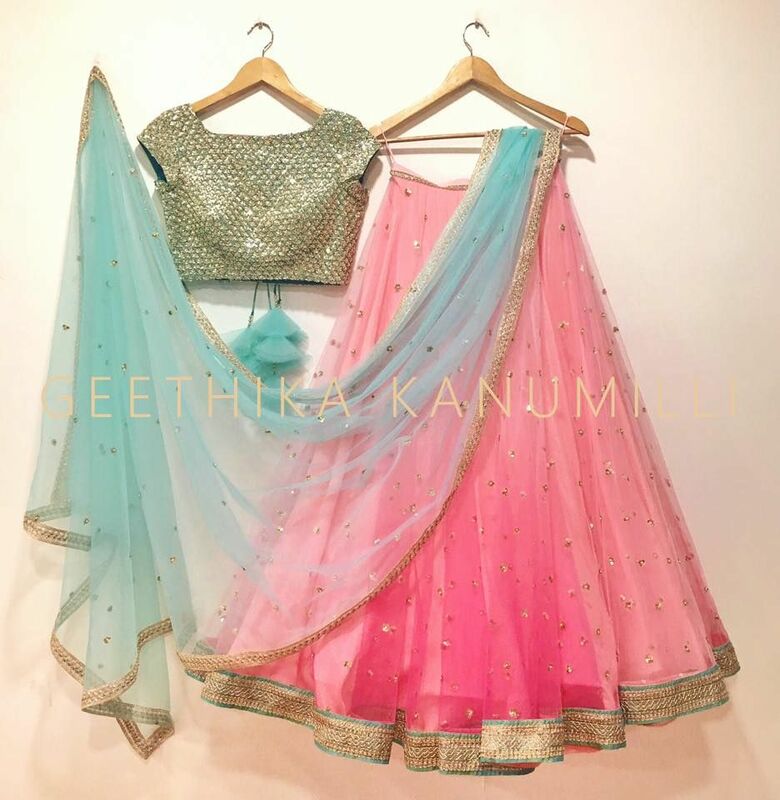 For the bride who likes pastel shades, here is a lehenga made in an icy shade of blue with embroidery made in a darker shade of gold that stands out against the pastel background for a sparkly bridal lehenga. The blouse is made on a golden base with embroidery and designs in blue covering on half of it. The lehenga is a graceful cascade of blue with golden work coming up from the end of it. The dupatta, made with a net material is kept simple with a plain border and designs interspersed along its length. Glam it up with green. A green blouse covered in an embroidery of a duller shade of gold paired with a flared lehenga. With a band of pink and gold for the waist and serenading drop of green dotted with gold, it looks it is shimmery and scintillating. The dupatta, made in baby pink is kept almost plain barring the corners which have one embroidered design. 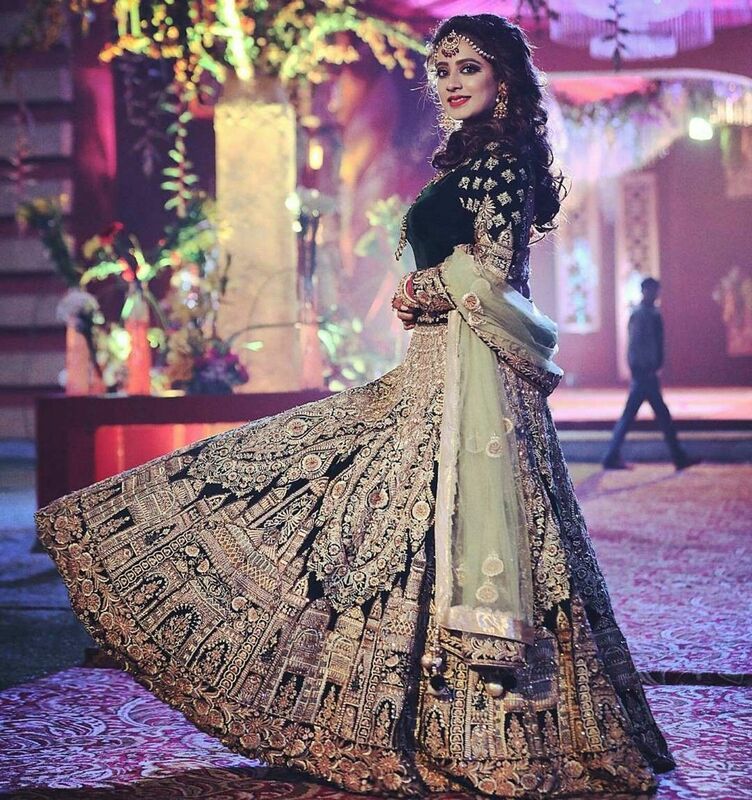 The simplicity of the dupatta taken on one side contrasts with the gorgeous lehenga. Add a shimmer to our outfit with a dusty light pink lehenga with gold embroidery that looks paint thrown over in random thin lines on a canvas creating a sparkly bridal lehenga. The blouse, with a sweetheart neckline and no sleeves, has a balance of the gold and pink. 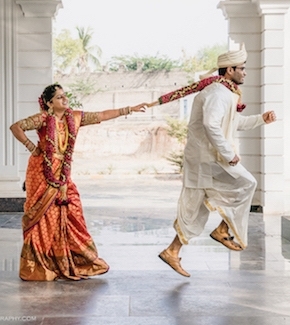 The lehenga, which flares out from the waist adding a swish to your walk. This is a chic look and would suit the modern bride who is looking to keep it simple and gorgeous. Glam it up and go all out with this black and gold lehenga. An embroidery so thick and intricate that the black underneath it can hardly be seen. It is paired with a monotone black blouse and a dupatta which is made of a material of net in a dull gold colour. The work on the dupatta is kept simple. Pretty in pink and blue. Pair up a golden blouse with a baby pink lehenga and a light blue dupatta. Keeping it simple, show off the pretty colours by keeping the embroidery to a minimal. One can also add a bit of colour to their blouse by adding a tassel or having a backless blouse, brought together by a blue string. White and red has always been a classic combination, and not a shade of off-white but the beauty of a milky white paired with a rich red. Scattered with minimalistic embroidery with only heavy designs at the bottom, complete with red and gold borders the lehenga looks extremely elegant. The blouse, kept to a simple make and design and a simple red dupatta helps to keep the simplicity and the gorgeousness alive. 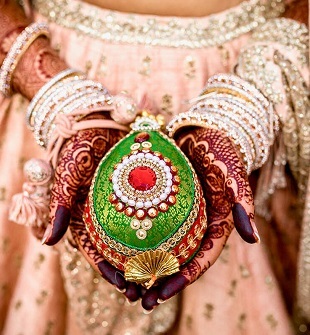 Go green and gold on the day of your sangeet for a sparkly bridal lehenga. The gold work on the dull shade of green is so intricately woven that looks like the fine network of veins on a leaf. Put together with a green dupatta with green embroidery work it creates a glamorous look. Wear a pastel look in the combination of pink and green. Simple and modern the blouse is a baby pink and the lehenga is a mint green, covered in work of gold. Having bold satin borders of the same colour and a baby pink dupatta to fall on but not cover the look it creates a brilliant yet sophisticated shine. A combination of peach and gold may not be a bad idea either for a sparkly bridal lehenga. The peach creates a vibrant look and a net lehenga made in this colour gives it a flare and vibrancy that a bride should wear. The blouse is made in gold with designs made in the same colour, making it beautiful but subtle.